Veterinary technicians, according to several reports, have been in demand in the United States since the late 2000s. This trend is expected to continue well into 2022. In the past, vet techs were popular among businesses involved in poultry and livestock, but nowadays, when practically everyone has a pet, they have become even more in demand. This is one of the reasons why a lot of people want to get into good vet tech schools. This is also one of the reasons why vet technicians receive a good salary rate. It may not be of the same level as the one doctors get, but it is good compensation for their skills, hard work, and dedication. But before we start talking about vet tech pay, let’s find out kind of work a veterinary technician really does. Generally, a vet technician’s job is similar in some ways to that of a nurse’s. His main task is to assist the veterinarian when conducting tests or physical examinations for animals. They help veterinarians take care of animals who are sick or injured. Likewise, vet techs are also often tasked with clerical responsibilities like file organization and record updating. In addition to this, when the veterinarian is out or not available, the veterinary technician is given the responsibility of taking care of and monitoring the animals/patients. While being a pet lover will definitely be a big help for vet techs, it is not the primary qualification. Like doctors and veterinarians, vet technicians need to complete a program designed specifically for the job they want to have. In the United States, several schools (colleges and universities accredited by the American Veterinary Medical Association or AMVA) offer veterinary technician programs that provide all the necessary education, training (theoretical and hands-on), and licensing. After completing the program, one will not automatically become a veterinary technician. Instead, one has to proceed to the credentialing stage, which usually starts with the Veterinary Technician National Exam or VTNE. Only licensed vet techs can start working with a veterinarian in a clinic, healthcare facility, or hospital. Becoming a veterinary technician takes a lot of hard work, skills, and dedication. Being a good one requires more hard work, dedication, and a commitment to constant improvement and learning. Likewise, an efficient and reliable vet tech knows that the job can be quite demanding. There will be times when one has to stay on his feet, at work, for 10 or more hours. These are some of the reasons why vet tech salaries are expected to be at a high rate. It is a specialized job, which means not everyone is capable of doing it. Vet tech wages vary from state-to-state, but an average rate is usually used as basis. But the numbers are good, though. In May 2011, according to the United States Bureau of Labor Statistics, vet techs earned an annual wage of more than $31,000 (average), or roughly over $15 an hour. About 10% of the best paid vet techs that years received around $44,000, while the lower 10% earned approximately $20,000 ($10+ per hour). Vet tech specialists or highly experienced techs can make upwards of $60,000-$80,000 per year. This also includes technicians that manage AVMA accredited programs that train veterinary technicians. For the 2012-2013 period, the average vet tech salary was pegged at more or less $29,000 per year. It was reported, however, that some received as much as $40,000 plus annually. Again, this is according to the US Bureau of Labor Statistics. In 2015, the median salary for a vet technician is roughly $31,800. This is according to money.usnews.com. That year, the highest paid vet tech received over $40,000, while the lowest paid got more than $20,000. Updated reports online, via indeed.com, indicated that the (approximately) average per hour salary of veterinary technicians as of May 28, 2017 is $14.65. New veterinary technicians are expected to get more or less $18,000 annually, but this is expected to increase as the months or years go by. One of the best ways for a vet tech to earn a higher salary is by choosing to specialize in a particular field like anesthesia. Also, if you choose to start with a specialization like research or animal research, you should expect a lower salary rate. Then again, you can always decide to do further studies and earn another specialization, one that comes with a higher rate once you are employed. According to 2010 statistics, the states that offer the highest veterinary technician salary rates are Massachusetts ($39,000-$45,000), New York ($22,000-$43,000), and California ($19,000-$45,000). In the year 2015, the highest pay rate for vet techs was in Alaska ($40,970), with Massachusetts a close second ($40,120). However, in recent more recent reports (March & April 2017), the state of Colorado is said to have competitive rates, too, particularly in the cities of Denver (average: $26,349-$50,023 per year) and Colorado Springs (with an annual average of $31, 426). It is therefore safe to conclude that the pay rate of veterinary technicians varies depending on location or in which state he practices. It is important to remember is that the kind of employer affects the vet tech pay rate. If you are employed in small or private clinics, the pay can be smaller. The same thing goes for vet tech employment in an animal shelter. Hospitals and laboratories that are federal or state government-owned often have a higher vet tech pay scale. Specialty clinics may also offer higher rates, such as those that focused on animal dermatology, dentistry, internal medicine, and cardiology. However, this is not true in all cases and instances. These healthcare facilities and institutions do not employ majority of vet technicians. Only a small number work for them because, first and foremost, they have a different standard or set of guidelines for accepting applicants. Likewise, you need to consider that most of these hospitals and clinics offer additional benefits to its employees. These may not be money, but they’re still essential for one’s daily survival. If you want a definitive advantage over other vet techs, though, you can always specialize. Earning a good pay rate will be easier if you specialize in a particular field. But it is important to know which ones to choose. For example, a vet tech working in animal research will not earn the same pay rate as a vet technician who specializes in anesthesia. And as previously mentioned, a new vet tech is expected to earn a lesser pay rate, but he can always move up the ladder by specializing. Veterinary technicians who completed a 4-year program or a bachelor’s degree are expected to earn more than those with associated degrees only. Four-year programs tend to cover more areas of veterinary tech and students have more opportunities to do hands-on practice. Likewise, majority of bachelor’s degrees offer internship programs that further enhance the skills of students (aside from giving them self-confidence). Veterinary technicians who have been practicing for years, and with a good track record, tend to earn more than those who just started their profession. So if you think you’re not earning that much yet but you’ve been in practice for only a year, fret not because you’re bound to earn more, especially if your work is exemplary. A city, state, or country with a high cost of living tends to offer higher salary rates than those with lower cost of living. 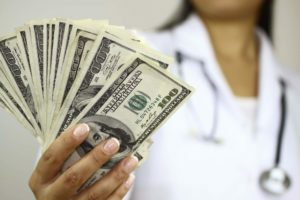 Therefore, the place or location where you decide to work or practice your profession is an important factor in determining how much salary you can get as a vet tech. Veterinary technicians are professionals who are trained to perform specific tasks that not everyone is capable of doing. They work just as hard as nurses, doctors, and their veterinarian bosses. For these reasons, they deserve to get a good salary rate. Above everything else, however, it is important to remember that your salary is not the only thing that matters in whatever job you do. The best thing about being given the chance to practice your profession is that you are able to do something you love and are passionate about – and you get paid for doing it. As a veterinary technician, you help a lot of people – pet owners/pet parents/pet families – who pin their hopes on you. You and the veterinarian are the only ones who can make them happy; who can restore the lives of their pets. That alone is already enough compensation for your hard work.